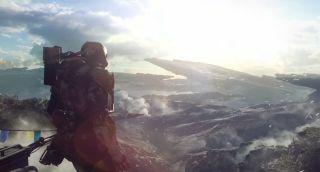 Between Anthem’s missions, players will get to fly around the world, exploring it on their own or with pals while completing jobs. It all looks like familiar stuff, from collecting stuff for lazy NPCs back home to participating in world events for the chance to net a big reward. IGN posted some footage of the freeplay mode, and you can check it out below. One moment did stick out as something that wasn’t just a repeat of what we’ve done in Destiny or Warframe. After the completion of a world event, a secret door opened, leading players to a hidden boss encounter with a very large, very angry foe. After launch, I expect those surprises will quickly dwindle, but I'm a big fan of events that go a step beyond just ending with a shower of rewards. During another world event, one of the larger examples of the local fauna decided to get stuck in, and while it’s not clear how Anthem’s ecosystem works, I do like the risk that dangerous predators might ambush me while I’m trying to deal with a different problem. As always, though, flying through canyons and jungle ruins looks like the main draw. There's not much about Anthem that really stands out, but I confess that I'd put up with all the familiar MMO trappings if it meant I could skirt across meandering rivers and weave through striking temples in my future-armour. Apparently taking a dip in the water also cools your suit down, letting you fly further, so it's practical, too. Anthem is due out on February 22.